Dr Georg Wilhelm Steller was a German physician and naturalist participating during the early 1740s in the last of Danish explorer Vitus Bering's Russian expeditions to the Arctic waters (now called the Bering Sea) separating Siberia's Kamchatka Peninsula from Alaska. During this expedition, Steller documented many new species of animal, including four very contentious forms that continue to arouse cryptozoological curiosity even today. I have already documented one of these, Steller's sea-bear, on ShukerNature (click here), so here now are the other three. 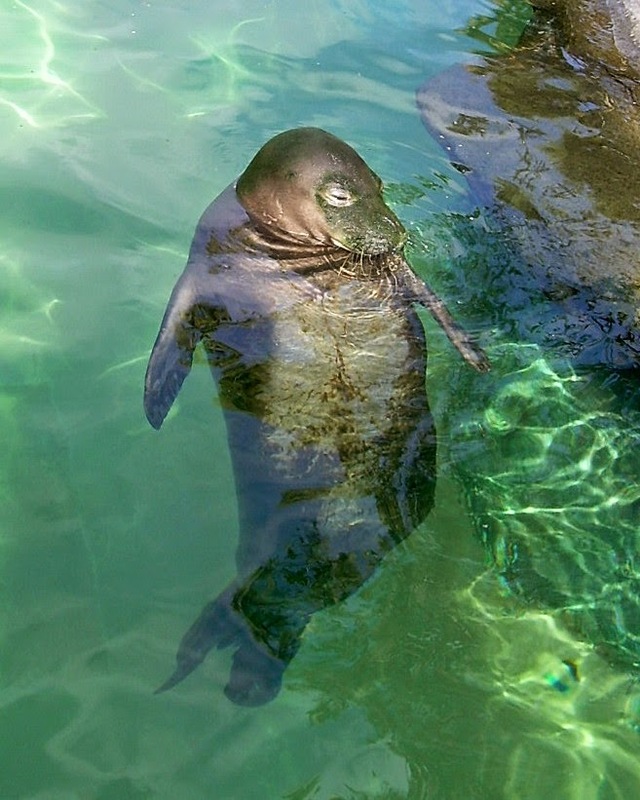 Distantly related to elephants, the manatees and dugongs are herbivorous aquatic mammals known as sirenians, with fish-like tails, no hind limbs, and flippers for forelimbs. 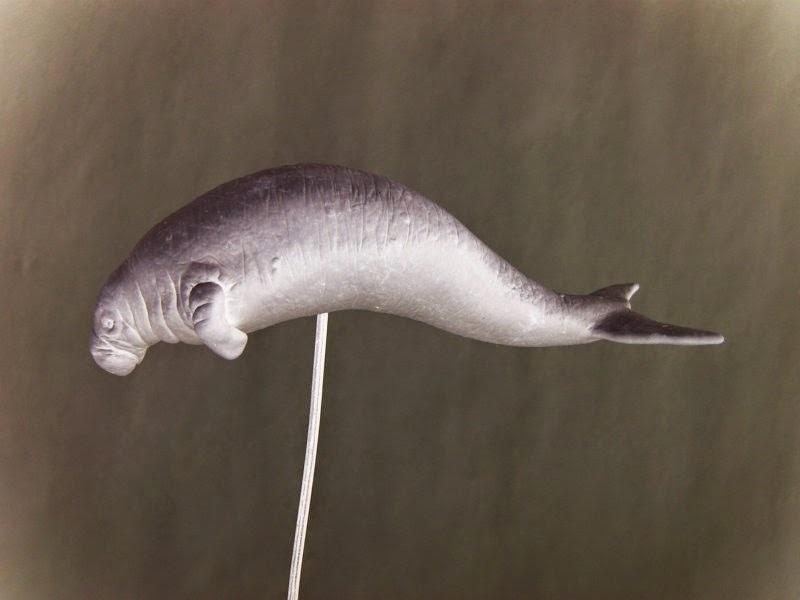 Nowadays, the largest living sirenian is the Caribbean manatee Trichechus manatus, which is up to 15 ft long, but there was once a much bigger species, called Steller's sea-cow Hydrodamalis gigas (=Rhytina stelleri). Measuring up to 30 ft long and weighing several tons, this gigantic sea mammal was discovered in 1741 in the shallow waters around Copper Island and nearby Bering Island - named after Vitus Bering, whose expedition was virtually wrecked here that year. While marooned on this island, Steller studied the sea-cows (the only scientist ever to do so), which existed in great numbers, but the other sailors slaughtered them for food. When he returned to Kamchatka with news of this enormous but inoffensive species, it became such a greatly-desired source of meat for future sea travellers that by 1768 - just 27 years after Steller had first discovered it - every single sea-cow appeared to have been killed. Not one could be found alive, and since then science has classified this species as extinct. Every so often, however, sailors and other maritime voyagers journeying through the icy waters formerly frequented by Steller's sea-cow have spied extremely large, unidentified creatures closely resembling this officially vanished, giant sirenian. In 1879, while exploring the polar waters traversed more than a century earlier by Steller, Swedish naturalist Baron Erik Nordenskjöld visited Bering Island in his vessel, Vega. He was startled to learn from one islander, Pitr Vasilijef Burdukovskij, that for the first 2-3 years after his father had settled here from mainland Russia in 1777, sea-cows were still being seen - and were still being killed, to use their tough hides for making baydars (native boats). Even more intriguing was the testimony of two other islanders, Feodor Mertchenin and Nicanor Stepnoff, who claimed that as recently as 1854, they had encountered on the eastern side of Bering Island a very large sea mammal wholly unfamiliar to them - which had brown skin, no dorsal fin, small forefeet, and a very thick forebody that tapered further back. It blew out air, but through its large mouth instead of through blow-holes like a whale, and about 15 ft of its body's length rose above the water surface as it moved. 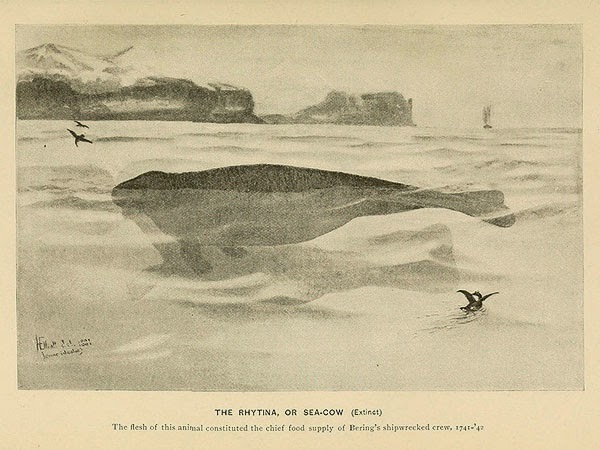 Nordenskjöld was sure that they had seen a Steller's sea-cow, because their description contained details of sea-cow morphology given in Steller's documented account, which they had never seen. However, when Stepnoff was later interviewed by American researcher Leonhard Stejneger, he concluded that the creature encountered by them had actually been a female narwhal Monodon monoceros (that famous species of toothed whale whose males characteristically possess a single long spiralled tusk, once believed to be the unicorn's horn). Stejneger also felt that Nordenskjöld had misunderstood Burdukovskij's statement regarding when his father had settled on Bering Island, and considered that the correct date was 1774, not 1777. In 1911-1913, a fisherman claimed to have seen a dead Steller's sea-cow, brought in by the sea current towards the Cape of Chaplin on Siberia's easternmost tip, close to the Bering Strait. Frustratingly, this potentially sensational discovery was never investigated. Perhaps the most compelling sighting occurred in July 1962 near Cape Navarin, south of the Gulf of Anadyr, lying northeast of Kamchatka's coast. Six strange animals were spied in shallow water by the crew of the whaling ship Buran about 300 ft away. They were said to be 20-26 ft long, with dark skin, an upper lip split into two sections, a relatively small head clearly delineated from its body, and a sharply-fringed tail. Scientists postulated that these animals must have been female narwhals. However, the description provided by the Buran whalers fits Steller's sea-cow more closely than a female narwhal, and it seems unlikely that experienced whalers would fail to recognise such a familiar creature. In summer 1976, some salmon factory workers at Anapkinskaya Bay, just south of Cape Navarin, reported seeing, and actually touching, the carcase of a stranded sea-cow. One of them, Ivan Nikiforovich Chechulin, was interviewed by Vladimir Malukovich from the Kamchatka Museum of Local Lore, and stated that the mysterious animal had very dark skin, flippers, and a forked tail. Reaching out to touch this creature, they had noticed that it also had a prominent snout. When Malukovich showed Chechulin various pictures of sea creatures to assist him in identifying what he and his colleagues had seen, the creature whose picture he selected as corresponding with their mystery beast was Steller's sea-cow. In the late 1970s, British explorer Derek Hutchinson launched an expedition to search for sea-cows off the Aleutian Islands, as did Soviet physicist Dr Anatoly Shkunkov in the early 1980s off Kamchatka. Neither met with success. Even so, as speculated by cryptozoologists such as Professor Roy P. Mackal in his book Searching For Hidden Animals (1980), and Michel Raynal (INFO Journal, February 1987), some sea-cows may have avoided annihilation by moving away from their former haunts, into more remote regions - of which the freezing waters and bleak coastlines around Kamchatka, the Aleutians, and elsewhere in this daunting polar wilderness are plentifully supplied yet extremely difficult to explore satisfactorily. STELLER'S SEA-RAVEN – UNMASKED BUT UNRECOGNISED? Whereas Steller's sea-cow, even if indeed extinct today, has been extensively documented and is physically represented in museums by skeletal material, we still have next to nothing on file (let alone in the flesh) concerning Steller's most cryptic avian discovery. While shipwrecked on Bering Island during 1741-42, Steller briefly referred in his journal to a mystifying species that he called a "white sea-raven" - a rare bird "...not seen in the Siberian coast...[and which is] impossible to reach because it only alights singly on the cliffs facing the sea". However, this species has never been formally identified; nor does it appear to have been reported again by anyone else. So what could it be? Seeking an answer to this baffling riddle, I communicated in June 1998 with cryptozoological enthusiast Chris Orrick, who has made a special study of Steller's own publications and other Steller-related works. 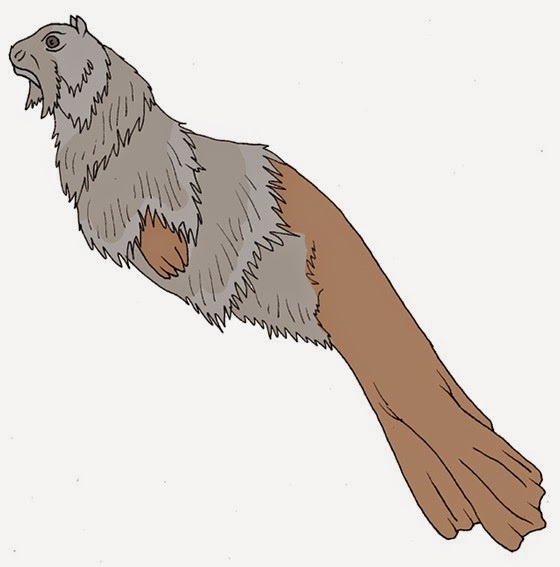 Chris speculated that Steller's white sea-raven may actually be some species that is known to science today, but was unknown at least to Europeans back in the early 1740s - possibly a species native to the Aleutians but rarely if ever seen around Kamchatka. 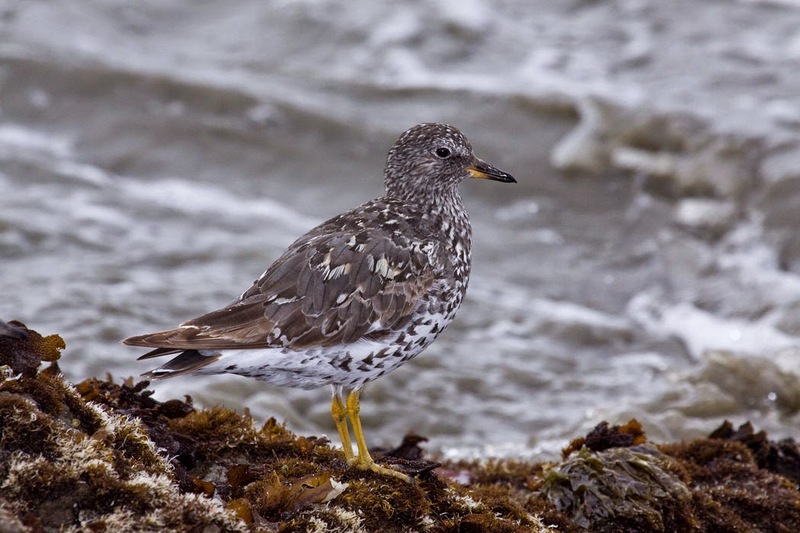 One candidate offered by Chris was the surfbird Aphriza virgata, a white-plumaged wader from Alaska and America's western Pacific that may not have been familiar to Steller. Danish cryptozoologist Lars Thomas from Copenhagen's Zoological Museum was also intrigued by the mystery of the white sea-raven's identity, and he has offered me his own opinion regarding it. Steller was German, and Lars pointed out that cormorants are referred to in German as sea-ravens. 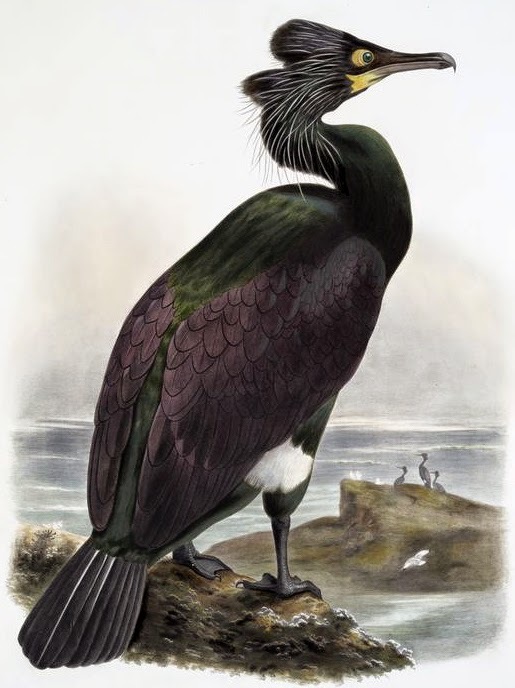 Indeed, a hitherto unknown species of cormorant, the now-extinct spectacled cormorant Phalacrocorax perspicillatus, discovered by Steller during this same expedition, was referred to by him as a sea-raven. Consequently, Lars argued that Steller's mention of a white sea-raven may in reality refer to a white cormorant (either an albino or a young specimen, as some juveniles are much paler than their dark-plumed adults). 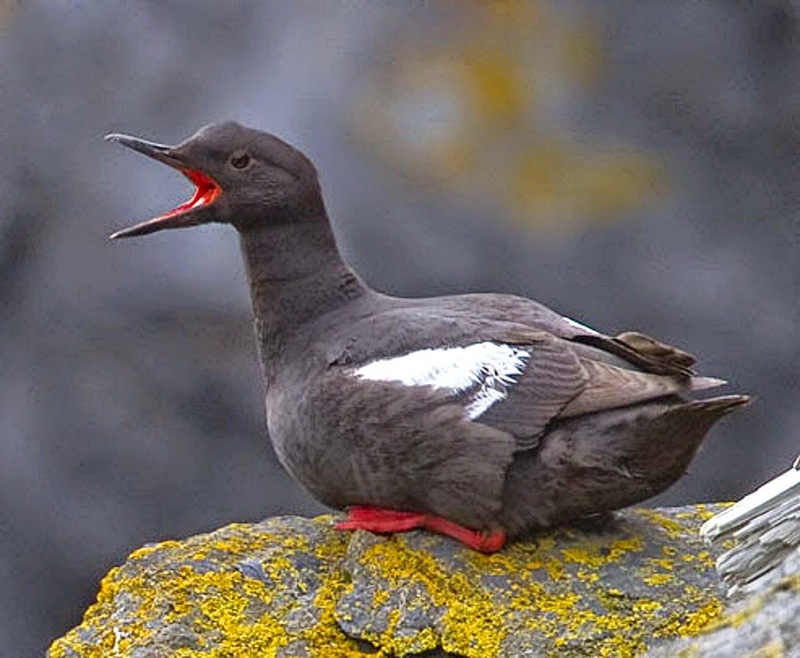 Alternatively, it may be a bird that superficially resembles a white cormorant, such as the pigeon guillemot Cepphus columba in winter plumage, or possibly even a vagrant gannet or booby. During our communications, Chris revealed that in a letter to the Russian Academy, dated 16 November 1742, Steller announced that he had prepared and sent two scientific papers - one dealing with North American birds and fishes, the other with Bering Island's birds and fishes. In view of Steller's meticulous manner of documentation, it is likely that the latter paper would have contained a detailed description of the white sea-raven. Unfortunately, however, neither of these manuscripts is known today, but they may still exist, albeit possibly unrecognised, amid the Academy's vast archives in St Petersburg. Unless these or other additional 18th Century documents on this incognito seabird are uncovered, however, its identity will probably never be exposed. Ironically, as Chris noted, we may already know what Steller's sea-raven is, but without realising that we know! It was about two Russian ells [about 5 ft] in length; the head was like a dog's, with pointed erect ears. From the upper and lower lips on both sides whiskers hung down which made it look almost like a Chinaman. The eyes were large; the body was longish round and thick, tapering gradually towards the tail. The skin seemed thickly covered with hair, of a gray color on the back, but reddish white on the belly; in the water, however, the whole animal appeared entirely reddish and cow-colored. The tail was divided into two fins, of which the upper, as in the case of sharks, was twice as large as the lower. Nothing struck me more surprising than the fact that neither forefeet as in the marine amphibians nor, in their stead, fins were to be seen...For over two hours it swam around our ship, looking, as with admiration, first at the one and then at the other of us. At times it came so near to the ship that it could have been touched with a pole, but as soon as anybody stirred it moved away a little further. It could raise itself one-third of its length out of the water exactly like a man, and sometimes it remained in this position for several minutes. After it had observed us for about half an hour, it shot like an arrow under our vessel and came up again on the other side; shortly after, it dived again and reappeared in the old place; and in this way it dived perhaps thirty times. After watching this extraordinary creature frolicking comically in the water with a long strand of seaweed for a time, Steller, greatly desiring to procure their strange sea visitor in order to prepare a detailed description, loaded his gun and fired two shots at it. Happily, the animal was not harmed, and swam away, though they saw it (or another of its kind) on several subsequent occasions in different stretches of the sea. No known species corresponds with Steller's description of this peculiar beast, which became known as Steller's sea-monkey or sea-ape. Moreover, until fairly recently, no further sighting of such a creature had ever been reported either, leading scientists to speculate that whatever it had been, its species must surely now be extinct. On a clear afternoon in June 1965, however, eminent British yachtsman-adventurer Brigadier Miles Smeeton was sailing by the central Aleutian Islands aboard his 46-ft ketch Tzu Hang, with his wife, daughter, and a friend aboard, when he and the others sighted a remarkable sea-beast. 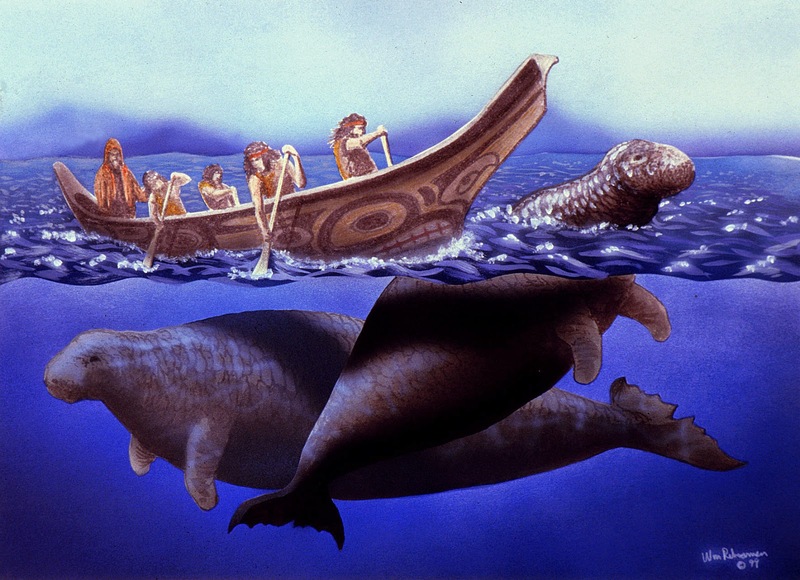 As since documented by explorer-journalist Miles Clark (BBC Wildlife, January 1987), lying in the water close off the port bow was what seemed to be a 5-ft-long animal with 4-5-in-long reddish-yellow hair, and a head more dog-like than seal-like, whose dark intelligent eyes were placed close together, rather than set laterally on the head like a seal's. Indeed, Henry Combe, the Smeetons' friend aboard their ketch, stated that it had a face rather like a Tibetan shih-tzu terrier "...with drooping Chinese whiskers". As the vessel drew nearer, this maritime mandarin "...made a slow undulating dive and disappeared beneath the ship". No-one spied any limbs or fins. Their observation of it had lasted 10-15 seconds, and they have remained convinced that it was not a seal. Although sea otters occur in these waters, this creature did not resemble any sea otter previously spied by them either. Conversely, it closely corresponds with Steller's description over two centuries earlier of his mystifying sea-monkey, thereby giving cryptozoologists hope that its species still exists. As for its identity, however, there is still no satisfactory explanation. Its inquisitive, playful, intelligent, supremely agile behaviour are all characteristics of seals and otters, yet Smeeton and his fellow observers are convinced that their creature was neither of these, and it certainly does not bear any immediate resemblance to such animals - set apart by its apparent absence of forelimbs, its asymmetrical vertical tail, and its mandarin-style whiskers. Equally, it seems highly improbable that any wildlife observer as experienced and as meticulously accurate in chronicling his observations afterwards as Steller would fail to recognise it as a type of seal or otter if this is truly all that it was. In fact, Steller was so perplexed by the creature that he made no attempt whatsoever to classify it. Via independent lines of research, Chris Orrick and Jay Ellis Ransom, formerly executive director of the Aleutian-Bering Sea Expeditions Research Library in Oregon, have both formulated theories that Steller's sea-monkey may have been a vagrant specimen of the Hawaiian monk seal Monachus schauinslandi - one that had wandered north far from its normal Hawaiian archipelago domain. Chris also suggests that it may have been undergoing its annual moult at the time, explaining its fur's appearance as documented by Steller. Nevertheless, it still requires an appreciable stretch of the imagination to convert the sea-monkeys described here into any form of seal, Hawaiian monk or otherwise. Perhaps one day a zoologist voyaging in the Bering Sea will espy Steller's most enigmatic discovery, which seems still to survive in these frigid waters, and in so doing may finally resolve a fascinating zoological mystery that has persisted for more than 250 years. 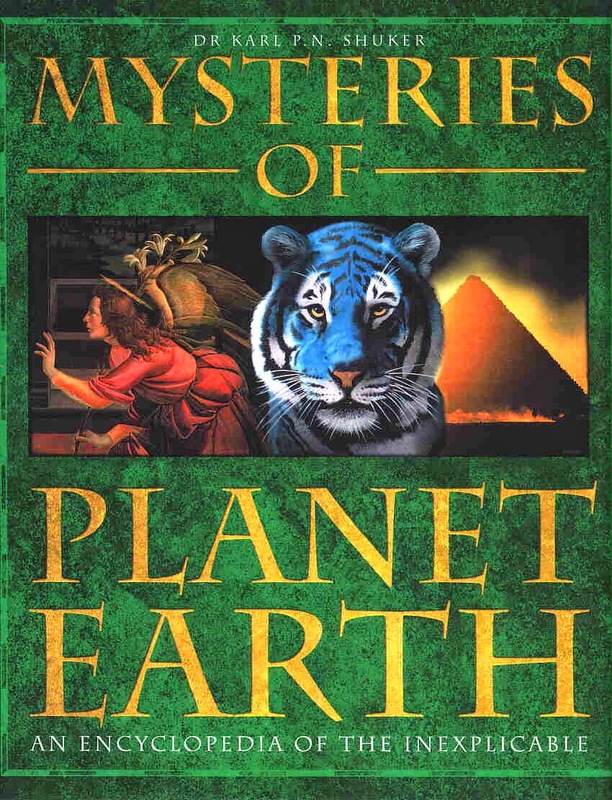 This ShukerNature post is excerpted from my book Mysteries of Planet Earth. Can you please give me more info on the text you are speaking of? I am trying to research the Stellar Sea Cow, extinction, etc. I saw a Steller's Jay yesterday here in Mexico. No mystery there, sadly.